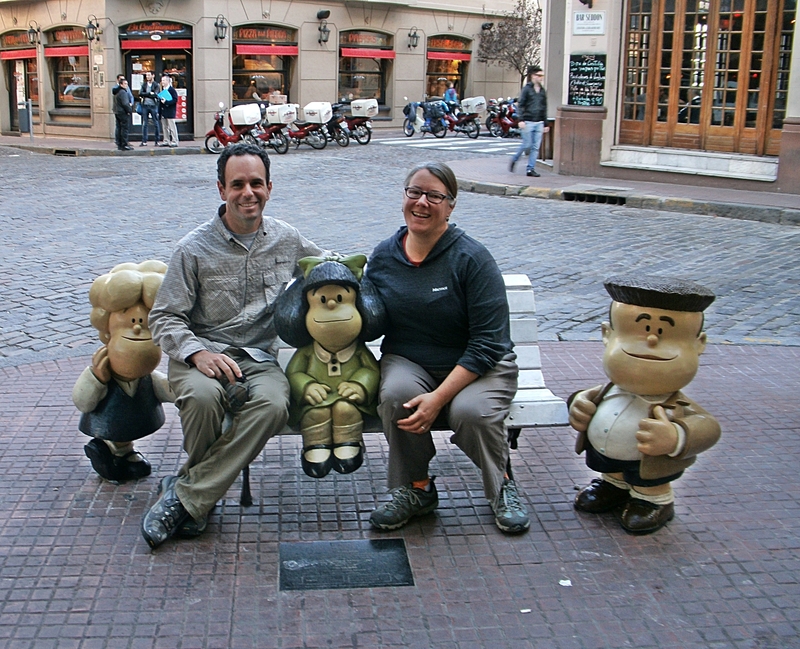 Today was a learning experience in figuring out how to get around Buenos Aires. I got lost many times…. Happily it was a beautiful, sunny day, nothing bad happened, and I survived a hectic but productive outing! After almost 9 hours of walking my feet hurt and I was grumpy but laughed at myself. Best of all there was no problem sleeping like a baby last night – well deserved Zzzzs! This is the third day in Buenos Aires. For the past few days I’ve been trying to accomplish what seemed like an impossible task – purchasing a rechargeable SUBE card to use for subways, buses, and trains. Without a SUBE card you must pay with coins, since bills are not accepted. In Buenos Aires, coins are very hard to find. To make commuting easier, in 2009 Buenos Aires initiated SUBE, a new electronic system for paying subway and bus fares. It’s an understatement to say that SUBE has suffered from major administrative problems. Getting a SUBE card sounded difficult, but not impossible, so I decided to pursue it. I’ll be here for a month and need an efficient and economical way to get around the city. Travel bloggers shared stories about how they had spent weeks trying to purchase the card and failed. Believe it or not SUBE cards are NOT sold at subway, bus, or train stations but at illusive and ever-changing kiosks in various parts of Buenos Aires. 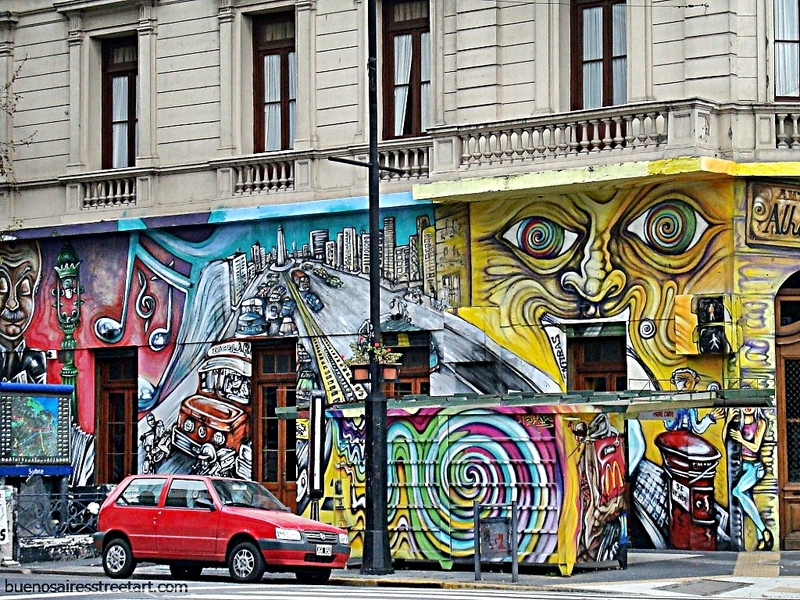 Buenos Aires does not have an integrated transport system run by the government. One organization runs the subway but 90 separate companies run the 141 bus lines. The trains are independent of both the buses and subway and I haven’t even thought about them yet. As of yesterday morning, I’d been to 4 different places listed as SUBE card purchase points, only to be disappointed each time. Had also heard that citizens of other countries must present their passport and fill out a comprehensive application divulging what seems a little too much personal information for a bus pass. 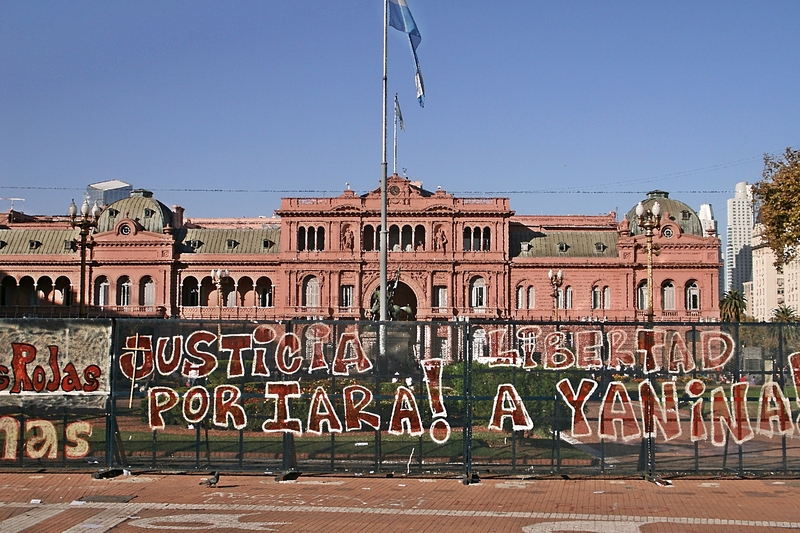 My last straw was OCA, an Argentinian e-commerce company that manages and tracks mail. 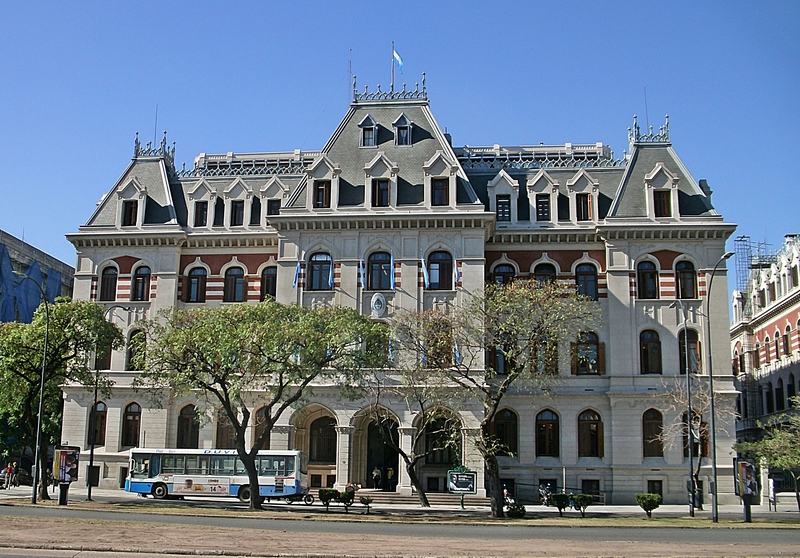 Advised to go to their office on Viamonte Street in Central Buenos Aires where they would issue the SUBE, I arrived to discover OCA no longer issues the cards. In turn, they referred me to a kiosk in front of Galerias Pacifico, a fancy shopping mall. I decided to try this one last place before giving it up. I walked up to the kiosk vendor, apologized for my poor Spanish, and asked for a SUBE card. He pulled one out, told me it would cost 25 Argentine Pesos (ARS), about $3, and asked how much I wanted to charge it for. Shocked, I handed him 100 ARS ($12). He activated the card and handed it to me. YEAH, it was my lucky day, PLUS he smiled and said “no problema” about the malo Español!! I practically skipped down the street feeling satisfied. Now, there was no excuse for not riding the subway and buses…. The subway lines in Buenos Aires are fairly straight forward but buses are unbelievably complicated. Research led me to purchase a Guia T Bus Guide which provides maybe a bit too much information… The pocket-sized guide (also known as the “bus bible”) enables you to search by maps or streets for the best means of transport available between two points. Signage in Buenos Aires is poor and that’s putting it mildly. Most buildings don’t have visible numbers so finding your way around takes perseverance. All you need is the street and cross street(s) or block of numbers. The ingenious Guia T must have taken a ton of time to compile. It works! In the back of the book there’s a comprehensive list of theaters, clinics, hospitals, museums, embassies, police stations, etc. with their addresses to use in mapping point to point transportation anywhere in Buenos Aires. The subway lines are easy, but they don’t cover the same amount of territory as the buses. After you know where you’re going the next big hurdle with the buses is trying to figure out where to catch them. Generally, their stops are a bit ambiguous. Buenos Aires is a late night city, and after midnight bus drivers stop for passengers who motion them over! Some bus lines are more reliable than others. A few buses run every 10 to 20 minutes and others are hit and miss. Walking is easier but too many hours on concrete pavement is exhausting and not wise at night. It felt good having the SUBE card but I decided to walk around more neighborhoods until I was tired before trying it out. I was confident that no matter where the day’s rambling led, I could get back to my apartment in Recoleta safely, without taking a taxi. I began by walking the Retiro section of Florida Street north of the center of town. You can find just about anything you want on Florida Street, including money changers offering top Dolar Blue exchange rates for USD. If you get Argentinian Pesos (ARS) from an ATM, the exchange rate is around 9 ARS to one USD. Most US banks charge a fee each time you use a foreign ATM and the Argentinian bank also charges you – a double whammy on top of a bad exchange rate. The blue money changer rate is 13 ARS per USD and there are no fees. That’s how messed up the monetary system is in Argentina. I was told to beware of Buenos Aires money changers but talked to a few and they seemed polite and as harmless as those in Bariloche. Policia were within feet of where they were changing money – but maybe that’s not much solace. 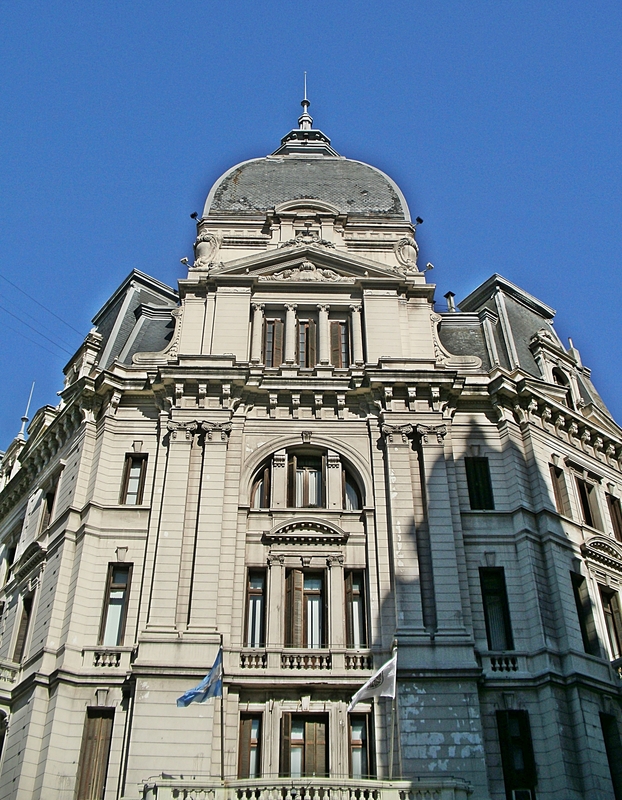 Later I passed majestic museums and embassies and other grand, impressive buildings along Avenida 9 de Julio and Avenida del Libertador. 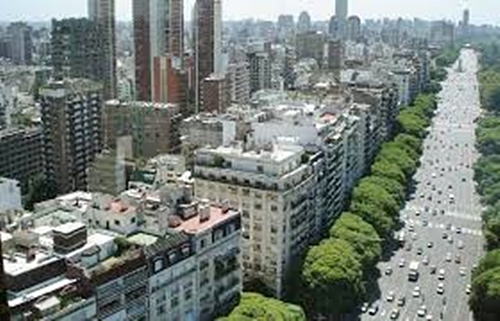 Avenida 9 de Julio is known as the widest avenue in the world. It was named in honor of Argentina Independence Day – July 9, 1816. Retiro buildings are huge, magnificent structures. It was difficult finding a vantage point for photographing them. The sidewalks are busy and continuously moving, so it’s hard to stop. Somehow, you have to get out of the rapid pedestrian flow to take photos. The next stop was Puerto Madero neighborhood to the east along the Rio De La Plata riverbank. Rio De La Plata is an estuary on the southeast coast of South America between Argentina and Uruguay. 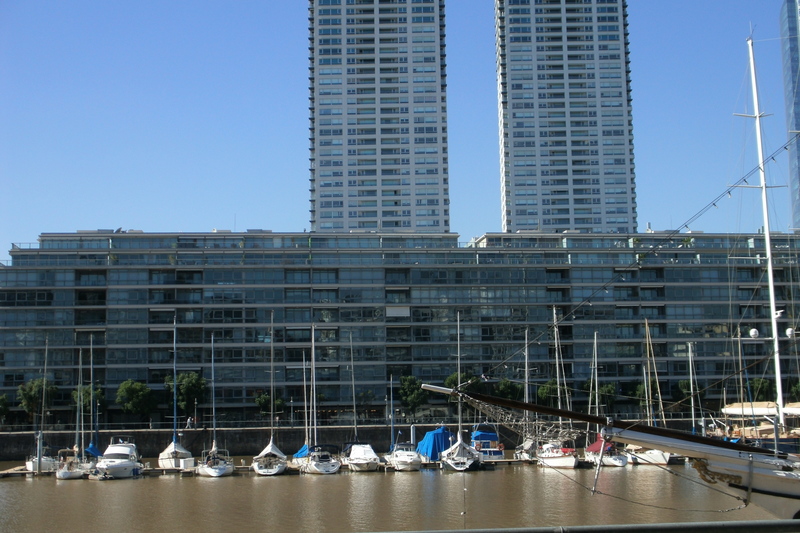 Puerto Madero neighborhood represents the latest architectural trends in Buenos Aires. It’s considered one of the most successful waterfront renewal projects in the world. 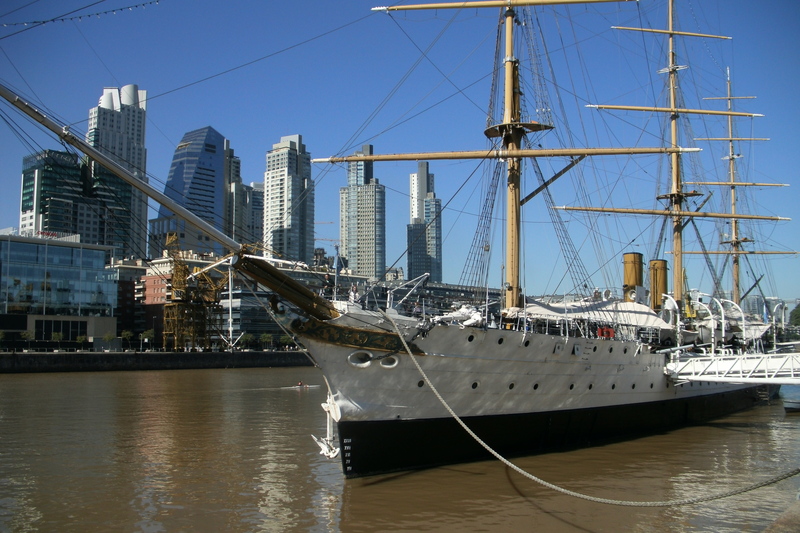 Beginning in the 1990s, there was local and foreign investment in regenerating and refurbishing Puerto Madero. Developers created elegant houses, offices, lofts, private universities, grand hotels, and restaurants. This new district was quite a change for a city that grew up ”turning its back to the river”. Led by the opening of the Buenos Aires Hilton in 1999, luxurious hotels, state-of-the-art multiplex cinemas, performing arts theatres, cultural centers, and office and corporate buildings, including Oracle, are mostly on the east side of Puerto Madero. The streets are teeming with affluent young techies and college students. 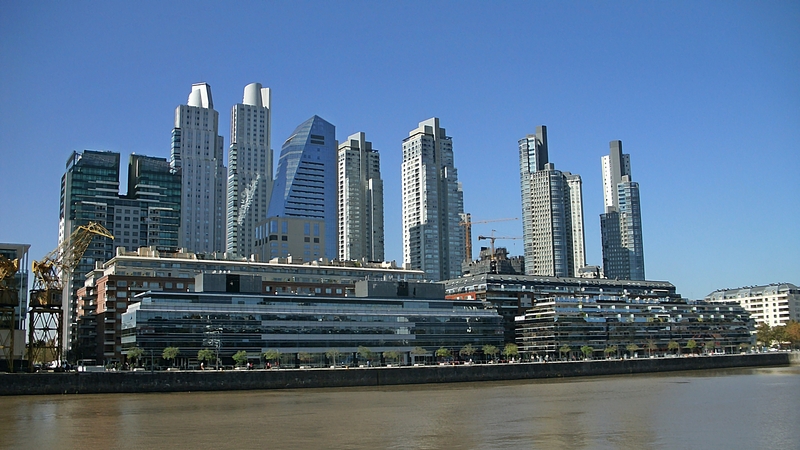 Puerto Madero redevelopment was of interest to renowned architects worldwide. Today it’s the “preferred address for young professionals and retirees. Increasing property prices have generated interest in the area as a destination for foreign buyers, particularly those in the market for premium investment properties”. 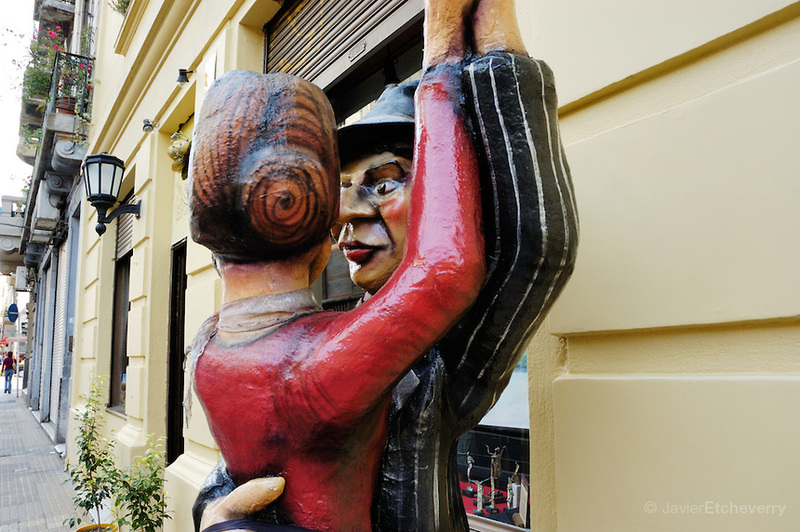 Every street in Puerto Madero is named after women. 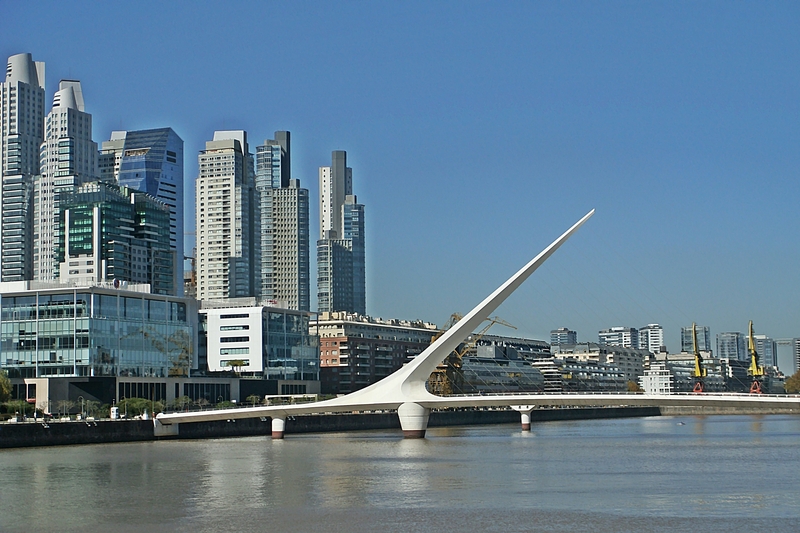 The Puente de la Mujer (Women’s Bridge) is the newest link between the east and west docks of Puerto Madero. In 2008 Amalia Lacroze de Fortabat, the wealthiest woman in Argentina, inaugurated a museum in Puerto Madero, the Fortabat Art Collection. Next, I walked south to San Telmo neighborhood. After getting lost yet again and ironically finding myself on Estados Unidas Street, decided it was time to take a break. I stopped for lunch at very Italian Los Talentos Pizzeria on Defensa Street. San Telmo is unique. It’s totally different from the other neighborhoods. The bohemian atmosphere is fun and artsy with creative specialty shops and interesting street art. 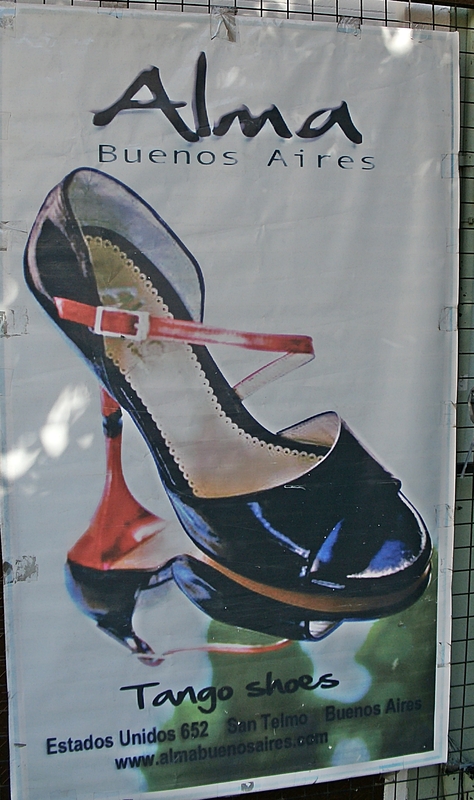 San Telmo is known for Tango parlors and shops that sell Tango shoes and dresses. After getting lost at least a few more times :o( I ran into two friendly theater students at a café. We chatted for a few minutes and then they steered me in the right direction. I caught the green D subway line to Callao station and made it back to my place in Recoleta. Now that I’m in control of my public transit life (ha ha ha) Palermo neighborhood is likely the next excursion. 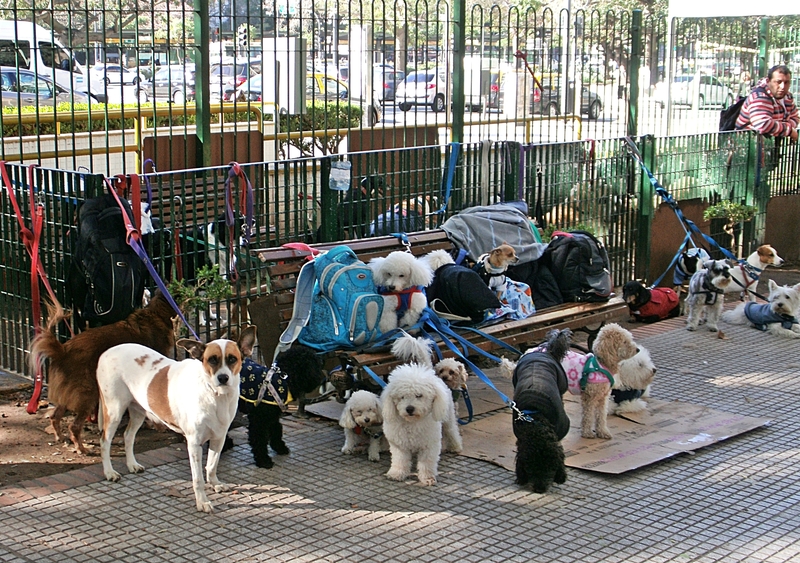 Think I will hang out in Recoleta today. This entry was posted in Argentina, South America and tagged Amala Lacroze de Fortabat, Amalia Lacroze de Fortabat, Argentina Independence Day, Avenida 9 de Julio, Avenida del Libertador, Dolar Blue, Fortabat Art Collection, Guia T Bus Guide, Los Talentos Pizzeria, Precio Dolar Blue, Puente de la Mujer, Puerto Madero, Retiro, San Telmo, SUBE, Tango Parlors by suemtravels. Bookmark the permalink. Sounds like you have finally got your pass to an amazing city. Tango next for those tired feet! Had no idea what to expect of Buenos Aires. It’s wonderful but very complex. Lots of green spaces too. The people are like no other place – friendly, helpful, very mellow in the subway and crowds except for traffic – which is terrible – where they toot their horns angrily all the time! Have lots to discover and learn now that I can get around :o)! Will look forward to reading about it!